Northeast Energy Efficiency Partnerships is designated by the U.S. Department of Energy (DOE) Office of Weatherization and Intergovernmental Programs to provide technical support to states and local communities in the Northeast and Mid-Atlantic region. As part of our overall engagement with states and communities, NEEP works to disseminate DOE guidance materials and other resources on best practices in energy efficiency policies and programs. The State and Local Energy Efficiency Action Network (SEE Action) is a project of the U.S. Department of Energy (DOE) and U.S. Environmental Protection Agency (EPA) that advances state and local investment in energy efficiency. Topical working groups include stakeholders and experts from across the country representing state and local governments, associations, business leaders, non-government organizations, and others. Several NEEP staff members serve on the SEE Action working groups, representing the interests of the Northeast and Mid-Atlantic region and helping to both inform and be informed by the SEE Action efforts. SEE Action’s website features whitepapers, case studies and other materials that can help states design the policy framework and efficiency programs based on national best practices and expert research from the foremost subject authorities in the nation. 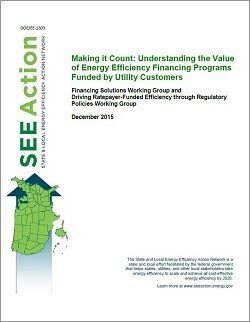 There is sector-specific guidance for residential, commercial and industrial programs, and pages on regulatory issues, complementary financing, evaluation, measurement and verification, energy data access, and combined heat and power. The State and Local Solution Center is intended as a one-stop shop on energy efficiency and renewable energy. It provides community and state policymakers and stakeholders with resources to advance successful, high-impact clean energy policies, programs, and projects. By championing state and local leadership, addressing specific market barriers, and promoting standardized approaches, the Solution Center aims to help states, local governments, and K-12 schools take clean energy to scale in their communities. NEEP is pleased to help interested parties access and interpret the wealth of helpful resources from the Department of Energy and its partners. If we can be of assistance, please contact Carolyn Sarno-Goldthwaite. 1. Can financing be placed in a regulatory context that would preserve accountability while providing sufficient flexibility to program administrators and customers? 2. Can the tools that have been used to screen traditional EE programs for cost-effectiveness and assess potential savings and impacts be adapted in ways that make them work for EE financing programs?